We’ve looked at birds, bugs, fish, moose, Paul Bunyans, and many other assorted collections of Minnesota Roadside Attractions in the past at HighwayHighlights.com. But how about the bears? There are a lot of really bad puns I could use in this list, but the one I used in the article’s title will have to suffice. 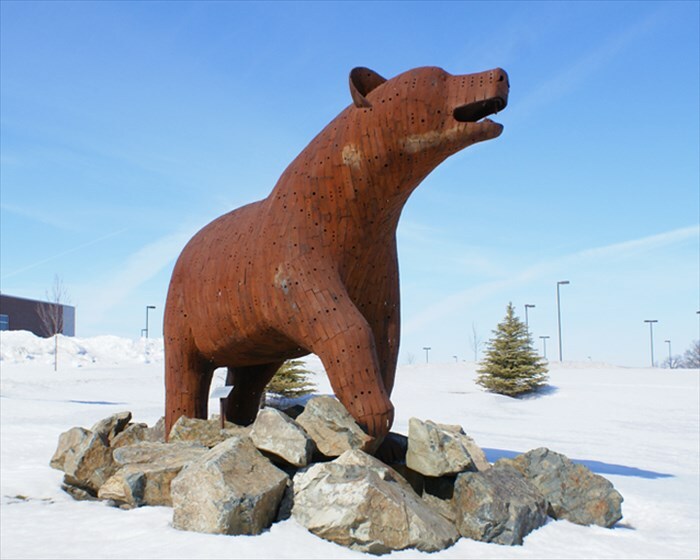 Join us for a tour of all of Minnesota’s Bear statues! 1. 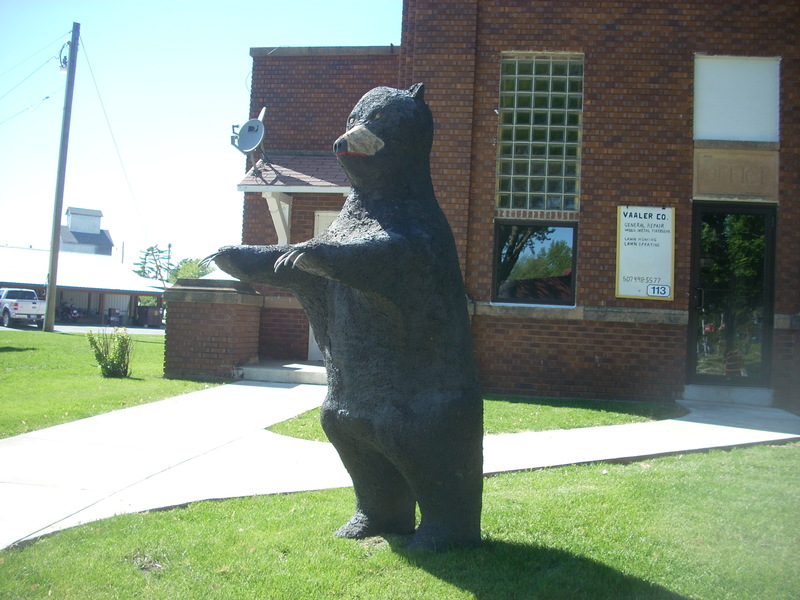 Big Bear, Hill City – The northern town of Hill City (between Walker and Grand Rapids) features a 10-ft tall bear statue on the side of the main stretch through town. He has been there since 1985 when he was donated by a local hunting club. This bear is friendly and photogenic. 2. 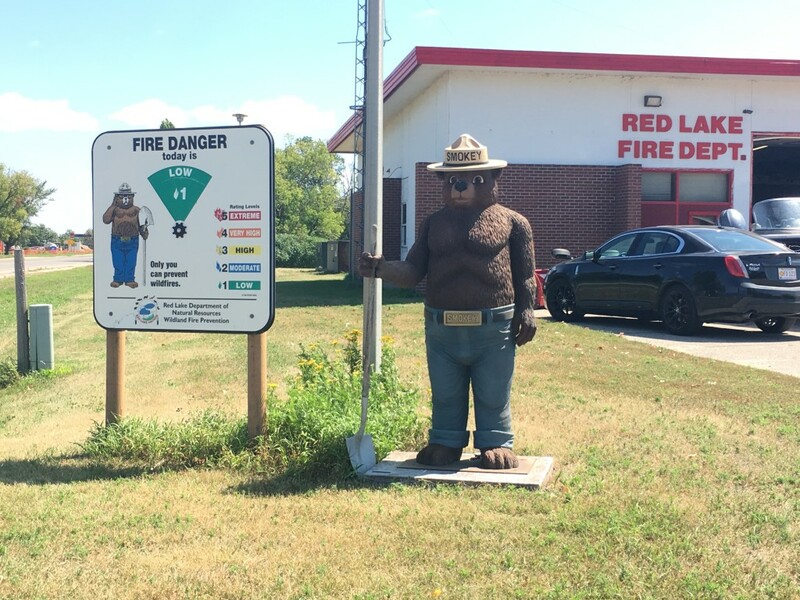 Smokey Bear, Red Lake – The mascot of forest fire-prevention, good ol’ Smokey Bear (sometimes known as Smokey the Bear), stands outside of the fire hall in Red Lake, MN. 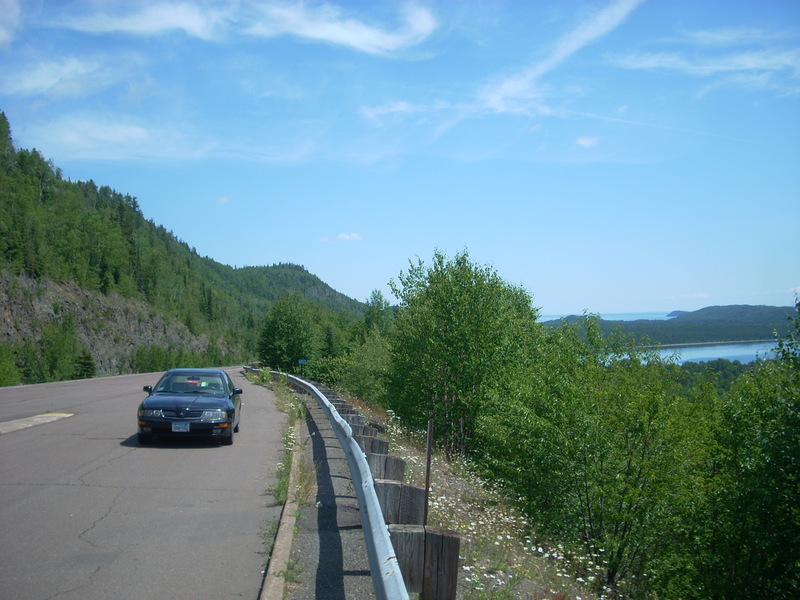 Many likenesses of Smokey can be seen around the northern woodlands of Minnesota, usually next to a gauge indicating the level of forest fire threat. 3. Woodcarved Tall Bear, Northome – The massive, chainsaw-sculpted bear in the small town of Northome (north of Bemidji), welcomes visitors into town just off of Highway 71. He is positioned in a memorial arboretum and was carved from a Red Pine back in the 1980’s. 4. 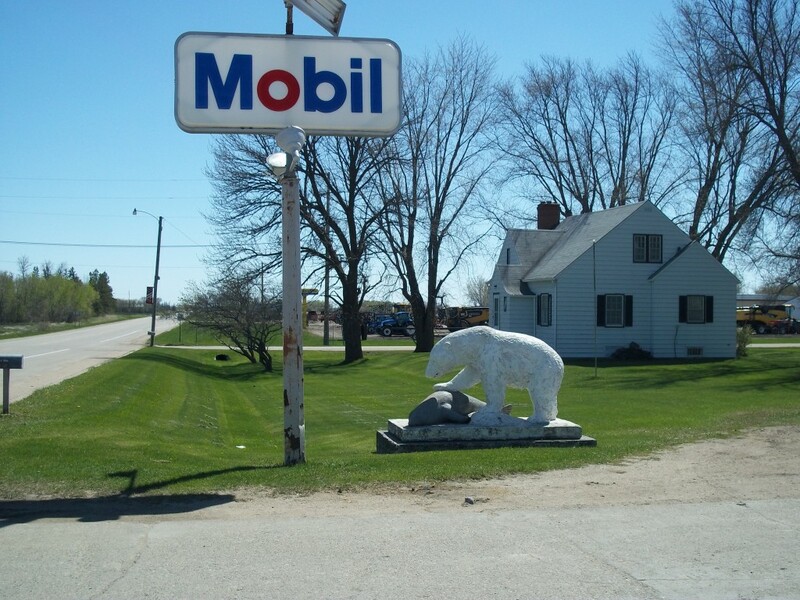 Polar Bear (and his prey), Winger – One of six concrete roadside attractions in northern Minnesota built by Ernie Konikson, the Polar Bear and Seal is found on Highway 59 in Winger outside of a Mobil Station. Winger is found between Mahnomen and Thief River Falls, and the statue was built in the 1960’s. 5. 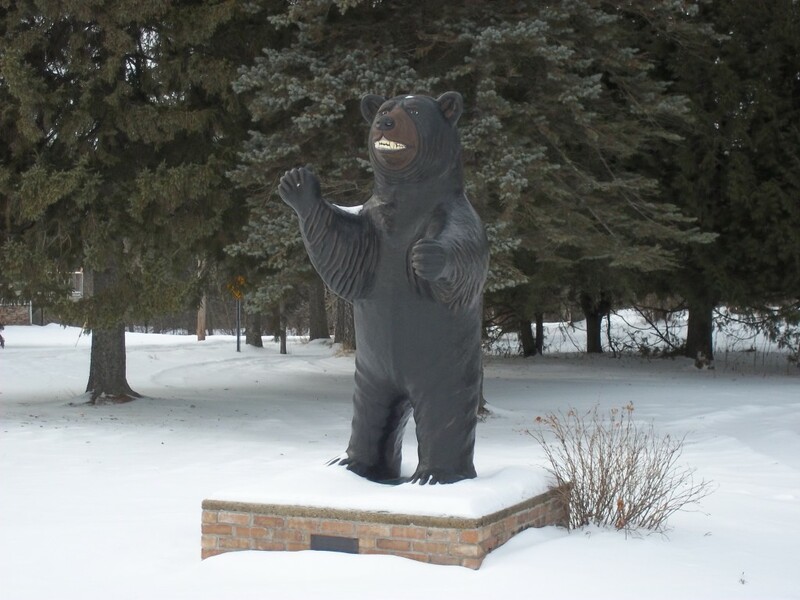 Byron High School Bear, Byron – Another Minnesota artist who has created many beloved Minnesota attractions, Ken Nyberg created this Bear statue for the town of Byron’s High School, whose mascot is of course the Bears. Most of Nyberg’s work is found in and and around his hometown of Vining, but this bear somehow made it all the way down to Byron (near Rochester). 6. 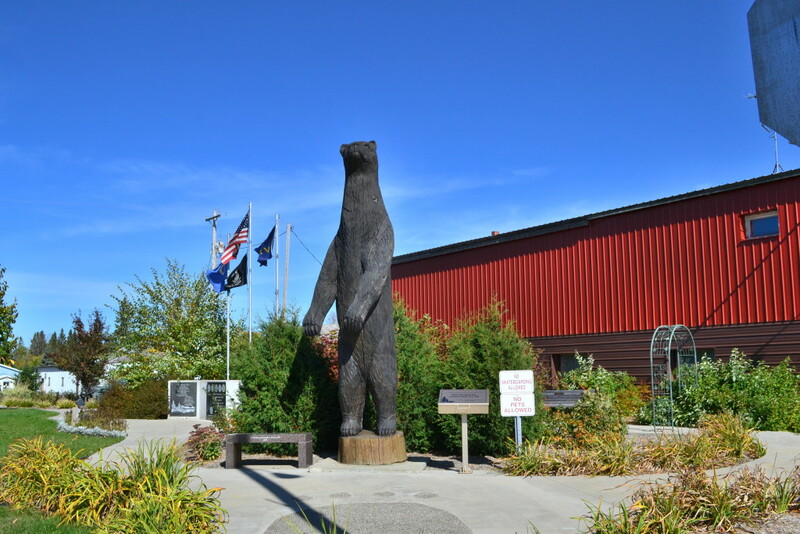 Spring Grove Bear – This dazed, possibly sleepwalking Bear outside of the old creamery building in the southeastern, Norwegian-Minnesota town of Spring Grove was built by local businessman Owen Vaaler in the 1970’s. Also nearby is a Viking and a Troll. 7. 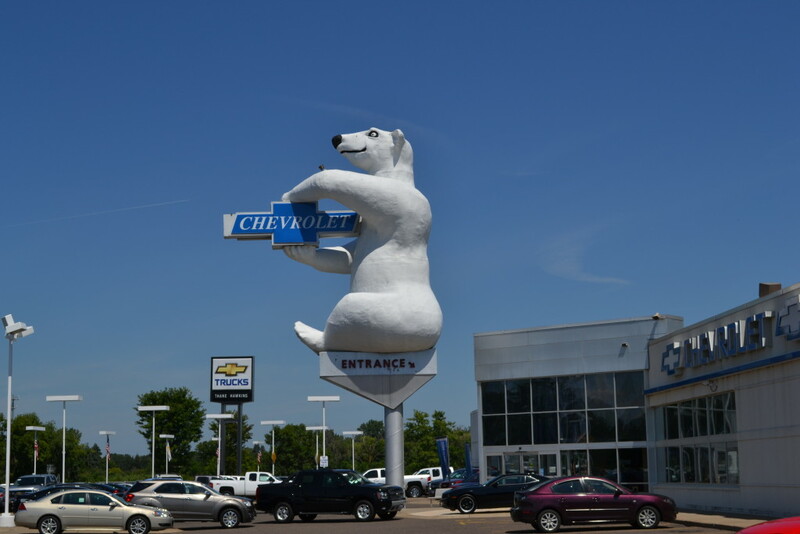 Polar Bear, White Bear Lake – One of the best and most iconic pieces of advertising in the state, the giant Polar Bear in White Bear Lake advertises the appropriately named Polar Chevrolet. Sometimes he is painted for whatever season he is in. He sits above the dealership, beckoning customers off the road for a photo and maybe a new Suburban, if those pesky salesman have it their way! 8. 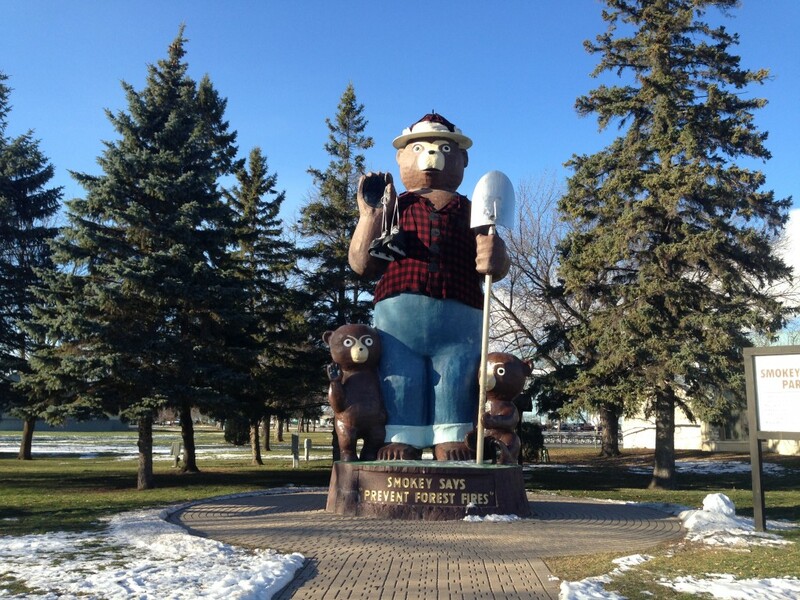 Smokey Bear, International Falls – Standing 26-ft tall, the iconic Smoky Bear Statue in International Falls has been around since 1954. He holds a shovel in one hand and sometimes seasonal items in the other (like a pair of ice skates in the winter). He has two cubs at his feet (Lil Smokies? ), and his signature catchphrase is emblazoned on the stump which he stands upon.